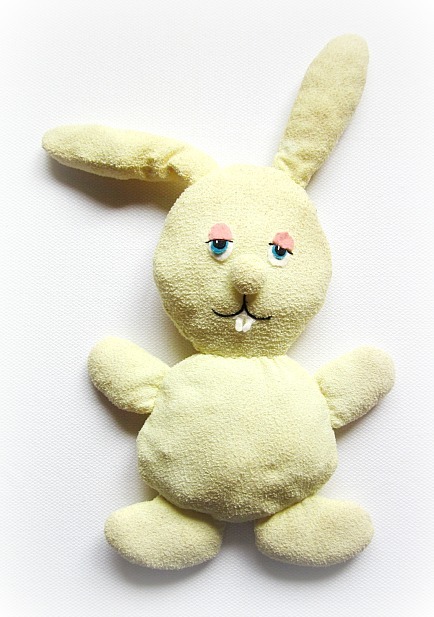 This bunny was gift to my first son, when he was born, from one of my aunts, she had already made for me and for lots of my cousins, we have a big family. The bunny had a coat but I don't know were it is, I have to make him a sweater. I love her dolls. He's so cute, isn't it? This bunny is so adorable!! What a treasure for your son! Such a cute keepsake for your son! What a special little guy. He really has personality, doesn't he? He looks a little...sleepy. Suggestive psychology for a baby maybe? I love this. Thanks for sharing! This rabbit is so adorable, Susana! And you are great keeping this kind of treasuries with such a story full of love.